The news of Waterloo shocked American readers, writes Donald D. Horward, and most writers and editors refused to believe Wellington’s famous dispatch of June 19th, 1815. On June 18th, 1815, the fate of Europe was decided on the wheat fields near the village of Waterloo. The results of this momentous struggle aroused avid and passionate discussion in America as well as in Europe. The young republic had only recently concluded its own war with Great Britain. Ties of alliance and friendship had long joined France with America. The exploits of Napoleon had occasioned much interest and considerable admiration. Now Americans confronted an event that clearly portended a shocking alteration of the balance of power in Europe, an event destined to be ‘stamped upon the pages of future history’. After Napoleon’s escape from the island of Elba and his restoration to the French throne, the people of the United States intently followed accounts of his preparation for war against the members of the Seventh Coalition. Information about the Emperor flooded into the United States from France; but the Maryland Gazette considered that ‘public curiosity remained ungratified’. The news of Waterloo first reached America from British sources. On the last day of July the brig Favorite, commanded by Captain Foster, reached the port of Boston after a thirty-five-day crossing from Liverpool. Captain Foster landed a packet of English newspapers describing in detail the French defeat at Waterloo, but the Bostonians sceptically refused to believe it. To add further credence to the story, several of the British journals included the Duke of Wellington’s famous dispatch of June 19th which not only described in considerable detail the manoeuvres and actions of the belligerents at Waterloo, but also claimed a decisive, but costly, victory over the French. At the same time other vessels, sailing from Plymouth, England, arrived at American ports with additional intelligence of the battle. Almost immediately, Wellington’s account of Waterloo was reproduced in the journals of the towns around Boston. By August 2nd, every major newspaper in the city of New York carried the British account of Napoleon’s defeat. Reaching Philadelphia during the second week of August, the story was taken across the Appalachian Mountains by horse to the villages of Harrisburg and Carlisle. The settlers of Pittsburgh learned of the great battle on August 12th, but the frontiersmen at the hamlet of Canton, at the western extremity of American expansion, did not read of the startling reverse suffered by the French until August 24th. At the same time, accounts of Wellington’s victory filtered south through the nation’s capital to Alexandria, Virginia, by August 10th. Nevertheless, the citizens of Charleston, South Carolina, only learned of the events attending Napoleon’s defeat during the third week of August. Without exception American readers were shocked by the contents of Wellington’s account of the battle in their local newspapers. In fact, the great majority of writers and editors refused to accept the English account as authentic. A large number actually ignored Wellington’s claim of victory and interpreted the battle as a French triumph. Citing a report from Captain Oxnard of the Cora who had just landed in Boston, many American writers claimed, ‘Bonaparte in person... and Lord Wellington’ engaged in a battle ‘in which the French were victorious’ (the Pennsylvania Republican, Harrisburg). To substantiate this claim further, an announcement from Brest, published in Boston, indicated ‘that illuminations had been ordered in France, in consequence of the victory gained over Wellington’ (thePatriot, Boston). Rather than ignore Wellington’s claims of decisive victory at Waterloo without evidence to the contrary, another group of American writers searched for discrepancies in the British account in order to impugn Wellington’s alleged success. A leading citizen of Albany, New York, asked his readers to remember that the Allies described their losses at 40,000 men. Therefore, Americans need not believe ‘that Napoleon should be totally defeated’. Noting that the English acknowledged the capture of 7,000 Frenchmen in battle, the writer concluded, ‘These circumstances confirm in our mind... that the balance of success down to the 20th [June], was on the side of the French’ (the Argus, Albany). In the same vein, a resident of Chillicothe, Ohio, reminded his readers that although ‘we find... the English claim victory, yet they remain at the point to which they retreated [Waterloo]’. Moreover, he ventured to predict that ‘the English will have been attacked once more before the 20th [June] and that the French will be in Brussels before the first of July’. This ‘legion no doubt sank into the earth—perhaps to keep company with their slaughtered enemies to the shades! But, if we believe this miracle, there is another which we cannot swallow, how Bonaparte lost 30,000 men, “which he had first taken from the enemy”—Match that who can!’ (the American and Commercial Advertiser, Baltimore). A large number of American journalists and their readers rejected Wellington’s victory announcement, recalling the numerous distortions incorporated into British reports during their war with the United States. Remembering ‘the shameful misrepresentations of the Ministerial Courier and Times in what ever related to our late war, we have a right to suspect everything they say about their war against France’. Some American writers responded to the British claim of victory at Waterloo with the utmost contempt. A leading citizen of Petersburg, Virginia, referred to it in the Courier as an ‘idle report’ and announced ‘We do not believe one jot or tittle of the... report—it is too vague’. There were, of course, a number of American journalists who accepted the British claim of success, but they were a distinct minority. Most of these were, in fact, members of the Federalist Party who believed that Napoleon was in league with their opposition—the Democrats. Assuming Wellington’s account of the battle to be true, a Bostonian expressed surprise that certain ‘democratick papers’ refused to accept it. Unconvinced by the deluge of English information supporting their claim of victory at Waterloo, the mass of the American public resolved to await French accounts of the battle. During the second and third weeks of August, the first French document supporting the British claim of success was published; this was a narrative of the French debacle by Marshal Louis Davout, Napoleon’s Minister of War. Soon, another account of Napoleon’s defeat, taken from the French Government organ, Le Moniteur, appeared in American journals. Simultaneously, a speech by the commander of the Prussian army, Field Marshal Gebhard Bliicher, was published congratulating the men of his Army of the Lower Rhine for their decisive role in defeating Napoleon at Waterloo. Even after a narrative by a Spanish eyewitness to the battle, General Alva, appeared in New York, many Americans still doubted the authenticity of the evidence. This scepticism disappeared, however, when Marshal Michel Ney, the French field commander at Waterloo, submitted his account of the battle to the news media, followed a few days later by a letter presented to the French Chamber of Peers by Comte D’Erlon, commander of the French ist Corps, describing the French defeat. There was no longer any reason to doubt the validity of Wellington’s dispatch. The Imperial army had died at Waterloo, and Napoleon again appeared helpless before the advance of a united Europe. Aware that if Napoleon were captured by the Allies, ‘his liberty, if not his life, will be forfeit’, a citizen of Albany, New York, lamented in the Argus, ‘He can no longer be a terror to “evil doers” [the Allies] and we confess that our sympathies, excited by an admiration of those traits of greatness which have astonished the world, and extorted high eulogium from his bitterest enemies, are strongly excited on his behalf.’ In conclusion the writer admitted, ‘Nor will we suppress the wish that he may yet find security beyond the reaches of his pursuers’. Despite widespread concern for Napoleon’s well-being, ominous reports reached America announcing his death. A tale published in a Baltimore paper declared ‘that Napoleon had been hung at Paris, every branch of his family [had been] massacred, and the members of both houses shot—the number consisted of eight hundred’. Another story unofficially maintained that Napoleon had lost an arm at Waterloo, while his brother, Jerome, had been killed in the fighting. A third account circulating stated that Napoleon had fled the field of battle in disguise and upon his return to Paris, he was ‘seized as a prisoner’ (Pennsylvania Gazette). Probably the most widespread report of Napoleon’s fate was brought by Captain Robb of the Warrior 74, that Bonaparte had been tried by a military court and beheaded. Not all Americans, however, were disturbed by the various reports announcing the execution of the Emperor. In fact, a small group of citizens actually clamoured for the life of Napoleon. A Connecticut editor reminded his readers that Napoleon ‘can surely have no claims on their [the Allies] justice for permission to live. The injuries of Europe, the spirit of thousands he has murdered, and the future peace of the world demand his life forfeited’. Once Americans were convinced Napoleon was still alive, rumours circulated up and down the coastal regions suggesting his possible whereabouts. Was he fleeing to a distant shore or had he been captured by his numerous and powerful enemies? Further credibility was added to this account when Captain Madge of the brig Ludlow, forty days out of Bordeaux, was halted by an English man-of-war, and ‘strict search was accordingly made over every part of the vessel; but not finding him, the boarding officers proceeded to examine the phizes of every passenger on board, to see if there was not a Bonaparte among them. They stated that... he [Napoleon] intended to make his escape in some American vessel, for this country; and that they would search everyone they might fall in with to find the Emperor’ (Pennsylvania Republican). Conversely, another observer, remembering the financial losses suffered by American merchants after Napoleon implemented his Continental System, asserted in the Salem Gazette ‘that should Bonaparte arrive in this country, he should be seized and held as property of the Government and exhibited for money—the first proceeds to be applied to the indemnification of the merchants whose property has been seized by his orders—the remainder to be retained by government in part pay of the expenses of the war waged on his account and in obedience to his command’. When the Americans learned of Napoleon’s surrender to a British war vessel at Rochfort, they were stunned. The more militant denounced him as a coward, declaring, ‘If he had bravely died sword in hand, at the battle of Waterloo, he would have acted a consistant part, and finished his “political life” as a Soldier’ (American and Commercial Advertiser, Baltimore). Although other Americans thought Napoleon ought ‘to have devoted himself in battle, rather than cling to life when it opened no prospect but ignominy’, they were ‘not so rigorous in [their] judgment as some pius political Christians, who pronounced him a coward... because he did not commit suicide’ (Pennsylvania Republican, Harrisburg). In response to these critical editorials, a writer in New York lashed back denouncing ‘certain self-willed, presumptuous fools, on this side of the Atlantic, apeing the folly of the meanest class on the other, who openly avow that they would wish to see him assassinated, and are even stupid enough to say, he is no general and a coward’. A citizen of Raleigh, North Carolina, came forward to defend Napoleon’s action, declaring that ‘the last virtual act of this wonderful man, is perhaps more extraordinary than all his preceding operations. Reports soon reached the American public that Napoleon had been imprisoned at Dunbarton Castle, while a more widely circulated rumour placed him in the Tower of London awaiting trial. Nevertheless, an astute citizen of Raleigh observed, ‘Imprisonment for life will doubtless be the future destiny of this extraordinary character, for neither the Prince Regent nor the Allies would jeopardize their popularity by putting him to death. “A great man struggling with the storms of fate” will ever excite commiseration in such minds as are not warped from humanity by the indulgence of strong political prejudices, and... yet all allow it is, the height of meanness to kick at the dead lion.’ A South Carolinian, although he had little sympathy for Napoleon as a man, pleaded for his life—not to be rescued from death but to suffer by living, tormented by his defeats. Nevertheless, there were many Americans who did not envisage great disaster in Napoleon’s surrender and probable imprisonment. One Virginian, writing in the Norfolk Publick Ledger, was convinced that ‘the residence of this great man, will ever be the spot of fame, and whether he is confined in the tower of London, or secluded in the most remote region of Europe, he will shine as the most resplendent luminary of the world’. Assured that ‘emperors, kings, and princes would be eclipsed in glory, should they ever appear within the circle in which he moves’, the author—believing erroneous reports that Napoleon had been taken into London—continued his editorial in the same vein. Retreating into the realm of fantasy, the author admonished his readers, ‘we should not have been surprised, from the frequent miraculous circumstances of Bonaparte’s elevation, if the shouts of the enthusiastic Englishmen [on the road to London] had been Vive I’Empereur Napoleon! And even if they had risen en masse, and proclaimed him king, it would not have been more wonderful and unexpected, than his entrance into Paris [March 1815]. And even prophecy may not be a vague conjecture, if on the death of George III the Emperor Napoleon should be received as the legitimate monarch of England’. It was not until August 23rd that the American public learned of Napoleon’s banishment to the rocky island of St. Helena situated in the South Atlantic. The majority of American journalists and writers lashed out with contempt at the English decision to exile Napoleon. After expressing amazement that the Emperor had not received ‘everything that the most exalted generosity could dictate’ from the British Government, a journalist of Harrisburg declared, ‘To the eternal disgrace of the English regent, his country, and his “friends in America”, Bonaparte received less generosity than felons transported to Botany Bay. The vilest rogues are permitted to take their families with them under certain circumstances; Bonaparte was not only robbed of his money and deprived of his friends, but even this is exalted generosity for a prince who has cast every indignity upon his own wife and child, who lives in a state of double adultery.’ The incensed writer ended describing the Prince Regent ‘as a vile miscreant and debauched wretch’. Comparing Napoleon to his antagonists, a Philadelphian noted, ‘Whatever history records to his [Napoleon’s] shame, it must assign more magnanimity to him than to his enemies. He entered their capitals, and spared them; they entered Paris, and laid it waste. He overran their territories, and gave back their sceptres; they conquered France, and (the narrative may run) imprisoned him in a sequestered island for life.’ A bitter Boston editor, dismayed by Napoleon’s fate, denounced the English, ‘If Napoleon flattered himself, for a moment, that he would be treated “like Themistocles”,’ he has made a great mistake. ‘If he placed any reliance on the generosity of the British nation, he betrayed the like ignorance of their real character. Read the history of that people,’ admonished the writer, from the Saxons to this ‘last race of imported monarchs... and you will find that hard heartedness marks their character.’ Examine their ‘bloody code of laws’ and ‘you will confess, that Napoleon had little reason for expecting that the executive of Great Britain would treat the greatest man of the age as Artaxerxes treated Themistocles’. Despite the irreparable disasters suffered by Napoleon during the summer of 1815, the great majority of Americans remained sympathetic to the French Emperor. They were so accustomed to reading of Napoleon’s extraordinary feats, that overwhelming evidence was necessary to convince them of his failure. When the proof was conclusive that Napoleon had not only been defeated, but had been also forced to throw himself on the mercy of his most bitter enemy, Americans responded with astonishment and disbelief; to them, he was still the ‘Conqueror of Europe, the hero of heroes’. No doubt many Americans grieved for the fallen French Emperor because he was involved in a struggle with America’s traditional enemy —England—while others predicted that if France succumbed ‘Great Britain will turn her resentment upon us... until she will menace our national independence’. 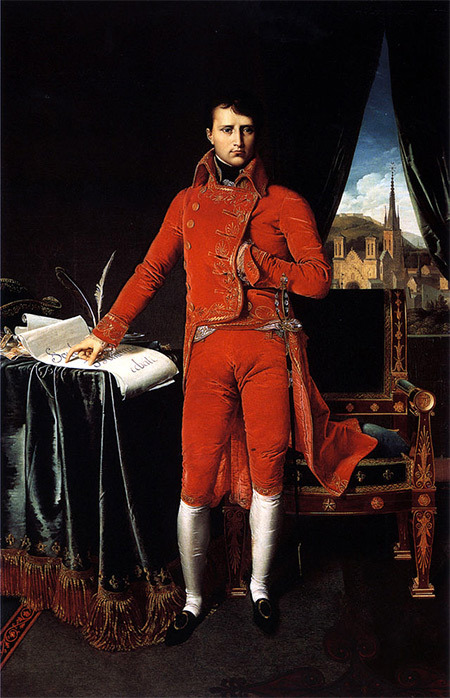 In spite of the motives, the indisputable fact remained: the majority of the people of the United States, disturbed by the demise of Napoleon, had a sincere and lasting interest in his present disposition and future safety.